Play some of the awesome games today and experience a whole new world with Ali Baba, a 5 reel, 20 payline casino slots online based on the classic tale of Aladdin. This Leander slot not only has a great theme but also has the most stunning and colourful graphics. It's time to hop onto the magic carpet and travel around Agrabah to search for the magic genie who will grant your wishes. Your wishes will come true as you take part in the open sesame free spins bonus and unlock treasure chests to find troves of golden coins. There are many other amazing features in this slot including wilds and a gold bandit bonus. Come and find these top UK slot games today. Travel across Agrabah on Aladdin's flying carpet in the search for golden treasure. Ali Baba is a 5 reel, 20 payline slot with a fairytale Aladdin theme. The sound of Eastern instruments can be heard while you play which adds to the whole gaming experience. The reels are placed behind a lovely desert scene with tall palm trees with the city of Agrabah in the background. Explore a magical world from the best new slot games now! The symbols include a sneaky snake in a basket, a twisted dagger, a camel, a golden beetle, a monkey, Ali Baba, an emerald ring, a barrel filled with gold coins and diamonds, one of the forty thieves and a beautiful belly dancer. The Wild Symbol - The wild symbol in Ali Baba is the belly dancer. She expands and covers the entire reel to create lots of amazing winning combinations. The Scatter Symbol - There are 3 scatter symbols in this game. The first one is the treasure chest which provides a cash reward when landing 3, 4 or 5. The other 2 scatter symbols help to unlock the bonus features. Gold or Bandit Bonus - Landing 3 bonus symbols on reel 2, 3 and 4 will unlock this feature. Once unlocked, you will be awarded with up to 3 Ali protections. Next, find the hidden gold by looking inside 6 vases. Open Sesame Free Spins Bonus - Landing 3 free spins symbols on reels 1, 3 and 5 will activate this feature. There are 3 elements to this game. Firstly, choose your free spins volatility, then select a treasure chest which will reveal free spins and multipliers. Finally, you can play the free spins round. If you enjoy a fairytale adventure, then you will love Ali Baba. This slot has such an exciting theme, incredible 3D graphics so many great features. Finding the gold is so much fun, whether that's in vases in the gold or bandit bonus or in a treasure chest in the open sesame free spins bonus. 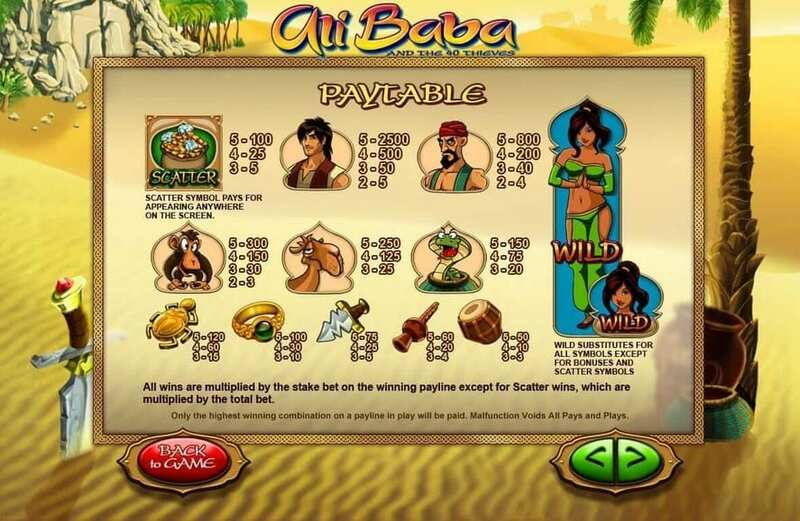 Ali Baba offers lots of fantastic prizes including a staggering 2500x multiplier. If you've enjoyed playing Ali Baba, then why not take a spin on Monster Madness?